Sard Verbinnen overtook Brunswick as the agency that provided comms support on the greatest number of M&A deals globally in 2017, amid an international slowdown in the market, according to new research. 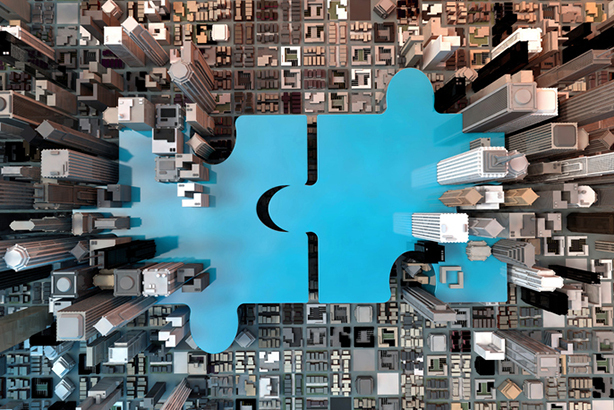 The research, from media analysis and data company Mergermarket, found that New York-headquartered Sard Verbinnen was the leading agency by both value and volume of deals it handled last year, working on 248 deals with a total value of $386.5bn (£274.2bn). Sard Verbinnen was top in the list of deals by value, despite seeing the value of deals it handled fall 15.3 per cent compared to 2016. The second placed agency in that list, Brunswick, saw a steeper decline – the value of deals it oversaw fell 34.2 per cent to $345.9bn. The London-based agency handled 15 fewer deals in 2017, and fell from first to third in the list of deals by number. Joele Frank Wilkinson Brimmer Katcher is the other top-five agency that saw a significant drop in the value of deals it handled last year (down 34.8 per cent to $296.9bn). In contrast, Finsbury Hering Schuppener, formed in 2016 with the merger of two WPP sister agencies, saw the value rise 48.8 per cent to £308bn. Kekst, a subsidiary of Publicis agency MSLGroup, experienced a 132.2 per cent jump, to $240.6bn. Jonathan Klonowski, research editor (EMEA) at Mergermarket, said: "While the appetite for M&A clearly remains strong, the pace of activity slowed slightly somewhat due to increased protectionism, regulatory concerns and general global uncertainty. M&A in 2017 was driven by a desire for innovation, as corporates looked to take advantage of the latest developments in technology." Sard Verbinnen also moved ahead of Brunswick in the half year report. In the US, Sard Verbinnen moved ahead of second-placed Joele Frank Wilkinson Brimmer Katcher, although both saw a significant fall in the value of deals, respectively, by 11.9 per cent to $352.8bn, and by 32.7 per cent to $292.5bn. While Sard Verbinnen saw the number of deals rise 46 to 221, its second-placed rival saw the number fall, from 162 to 151. Fast risers included Kekst (value of deals up 130.4 per cent to $207.2bn) and Sloane & Company (up 247 per cent to $81.3bn). There was a less strong performance for Brunswick, where the value of deals in 2017 dropped 54.8 per cent to $151.8bn; and FTI, where the value was $110.4bn, a decline of 29.6 per cent. In the UK, FTI Consulting rose in fourth to first in the list of deals handled by value; the value rose 299.2 per cent to $111.8bn. Brunswick was narrowly behind in second place, as the value of its deals grew 10.1 per cent to $111.6bn. 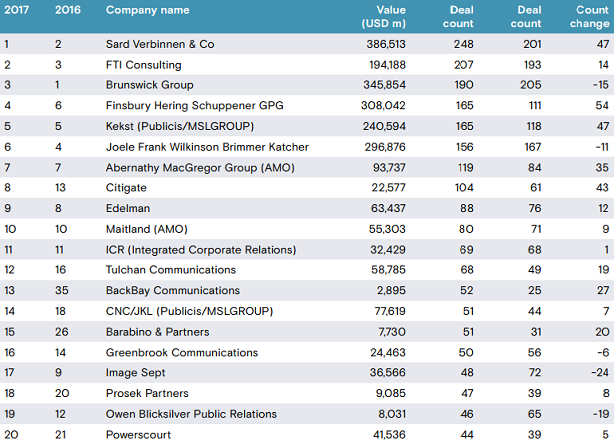 Sard Verbinnen moved to third on the list, handling deals valued at $75.5bn, ahead of Ashton Consulting ($65.2bn) and Finsbury Hering Schuppener – the latter fell from second to fifth in the UK ranking by value. Maitland (up 289.2 per cent to $42.8bn), Tulchan (up 255.9 per cent to $35.2bn) and Joele Frank Wilkinson Brimmer Katcher (up 150.2 per cent to $32.2bn) were among the other strong performers. FTI also topped the list of deals by number in the UK. It handled 109 in the year, ahead of Maitland (69), Finsbury Hering Schuppener (59), Tulchan (58) and Brunswick (57). In Europe, Brunswick maintained its top ranking by value of deals ($259.4bn) and its second place position by the number of deals (119), although deals were down 7.4 per cent by value and four by number. FTI had a strong performance, mirroring the situation in the UK, moving from fifth to second in the list by value of deals (up 23.7 per cent to $176.5bn) and keeping the top spot by deal count, with 154. Brunswick also maintained its top position in Asia Pacific (excluding Japan), although it was a sharp fall in the value of deals (down 41.7 per cent to $68.4bn), while the number of deals it dealt with rose from 42 to 43. Second in the list by value was Domestique Consulting, which handled deals worth $42.5bn, up from $12.2bn in 2016. 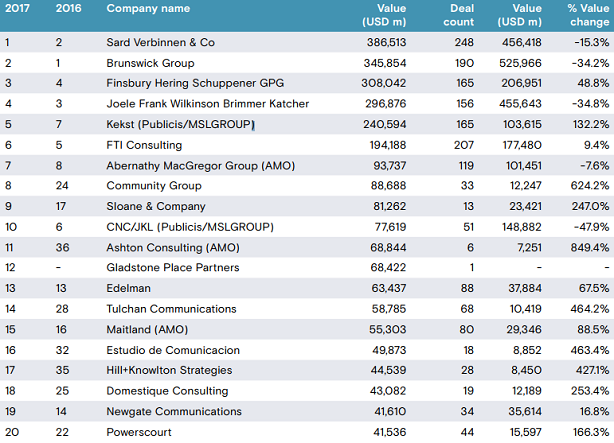 In Japan, Sard Verbinnen was top with 18 deals, followed by Finsbury with 17. Do former journalists still make good PR executives?